ENERGY. I enjoy my coffee in the morning, but the fact is I don’t need artificial stimulation to get moving — I’m naturally caffeinated. If you’re a person with a lot of energy, you know that if you don’t release it in a healthy way, it’s no fun for you and the people around you. 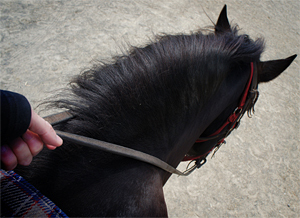 Think of it like this: If you ride an energetic horse, you make sure your horse gets moving before you climb in the saddle, otherwise it can be challenging to contain your horse’s energy. I’m like an energetic horse, and I’ve always been on the move. Through elementary and middle school, I did ballet and was on a gymnastics team. In high school I took dance classes and even did a stint on the track team, and through college dance fitness classes kept me moving. As an adult, I do anything that’s fun and challenges my body. Yoga is my cornerstone because it helps me stay strong and flexible for all my activities — hiking, group fitness classes, stand up paddle boarding, running and, of course, horse riding. Have you noticed that non-horsey people don’t think of riding as a sport or form of exercise? They think you just have to sit there and the horse does all the work. HA! How many times have you climbed off a horse and nearly fallen on your bum because your legs were so tired and sore from squeezing and squeezing and squeezing to get your partner to pick up the pace? If you encounter this misconception, challenge those people to straddle a bench and post or hold two-point for just a few minutes. I guarantee they’ll get that horse riding is a workout, and straddling a bench is a lot easier than trying to stay balanced in stirrups and steer a horse while posting. Heck, some entrepreneurs have even recreated a horse-less version of “equicise” with devices like the Equicizer and iGallop! Lately equicise is a priority for me as I get in riding shape for my upcoming trip to Colorado, where I’ll spend five days communing with horses and horse girls in the Rocky Mountains. I’ve been dreaming of this trip for three years, and to enjoy it fully I want to be in the best shape possible. So in addition to my regular yoga and fitness classes, plus training for a running race in September, I’m back in weekly riding lessons and weekend trail rides. As you can imagine, I’m thrilled to be in the saddle on a more regular basis. I hope you’ll enjoy reading horse tales and seeing photos from my summer adventure. And I hope you’ll join in the fun and share your own horsey adventures! Riding Miss Daisy. 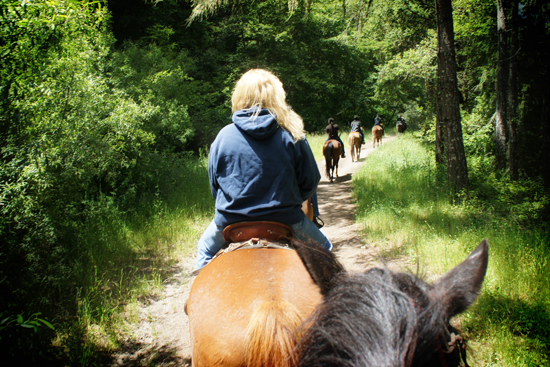 This past Saturday I enjoyed a beautiful trail ride in Olema, CA. This is Daisy, a feisty draft mix. With her wide back, she was super comfy to ride. Anyone recognize my jeans? Bringing Up the Rear. My riding buddy and I were the only intermediate riders in the group, but for whatever reason they put us at the back of the pack, and insisted on having us stay in order, single file. Daisy kept trying to nose ahead of Colonel (occasionally nipping his behind), and she didn’t like me pulling her back and depriving her of that sweet grass alongside the trail. A couple of times she turned her head and half-heartedly tried to nip my foot. Silly girl. 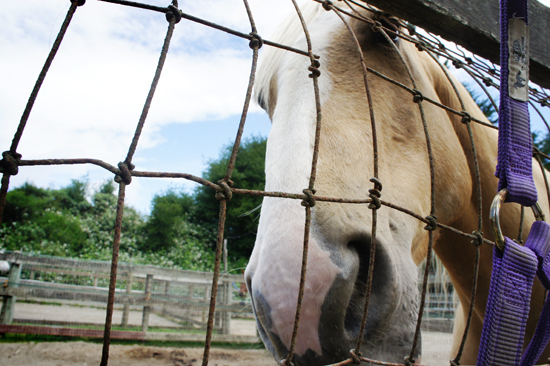 Palomino ♥ ♥ ♥. My riding buddy fell in love with this sweet palomino. Sadly “the horse does all the work” is a misconception that runs rampant through nearly every non-horsey person I know. 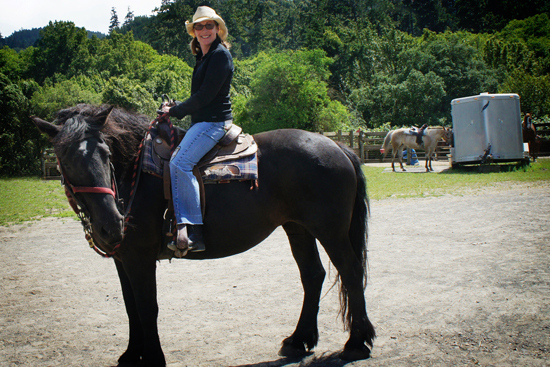 One of my friends never appreciated how challenging horse riding can be, at least until I took her on a trail ride and she had trouble even getting on her horse. Haha at least that’s one less person who thinks that way. i hope you have fun in Colorado. It really is a cool state! my friend and i have argued for a long time about the sport of horseback riding. these arguments usually end with my falling over from laughing about it. I would do what Madelaina did, but she is terrified of horses. Oh well. At least we know the truth. I hope you are enjoying your riding, LeadMare. And no, I’m sorry I can’t say I recognized your jeans. Perhaps I haven’t been around GHC long enough? Daisy seems like a real cutie. Just this riding last lesson I was breaking a sweat after rounds and rounds of trotting either in the balance position (like a two point but you don’t lean over the neck at all), sitting, normal posting, or over poles or the diagonal. I started to giggle to myself at people who have scoffed at the idea of riding being a sport. And I’m only a novice/intermediate rider with little riding experience! You’re right, icehorse at least we know the truth! I’ll be back a little later, probably with a new peice. Oh wow! Day before yesterday I went for my first trail ride! I was so happy to actually be riding the horse on my own that I almost cried! (All I had done before was ride the ponies at the fair that go around in a circle and ONCE I rode a real horse, but someone was leading it very slowly around a pen.) So I got on a horse named Josy and boy was she stubborn! I was third in the line and Josy kept stopping or walking VERY slowly no matter how much I prompted her and kicked her sides. Then FINALLY near the end of the ride she sped up, but then she kept trying to pass the horse in front of me! I’m glad that I knew a lot about horse back riding before I actually did it. TOO MUCH FUN! Beautiful just beautiful! looks like you got to ride a fluffy gentle giant huh? =D I love the craft thing with the jeans to! Oh and excellent edit with the blog background LM!! Have an horsearifif summer gals! Thanks HF! Yes, Daisy was definitely a giant, especially compared to my lesson horse — a sweet little Haflinger. Have a good trip your horse is realy beatyfull! Lovely blog, hope you have a good time in Colorado and that you embrace the horsey-ness! I totally know what it’s like to have to prove that horse riding IS exercise. And yes, let me tell you it is worth it to see the looks on people’s faces after i have devised ways of sitting on chairs like on a horse! CocoaHorsey, a few girls here are lucky enough to have their own horse, but must of us don’t. Hopefully you’ll find some horse loving friends at camp — have fun!